Image by quinet via FlickrThings are changing around here again. Ended up with another roommate but that is a story for another day. Today is for things that have brought a smile to my face this past week. 1. 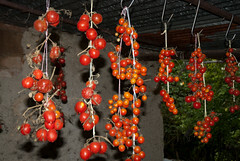 I have cherry tomatoes that are starting to turn red..well orange actually but it is a step in the right direction. And I am happy that they are cherries. I didn't think that we even planted any of that variety. 2. My order from Artbeads has finally arrived! I ordered them back on 8/13 and waited impatiently for them to arrive. I mean seriously, they are only 20 miles away from my house. Well I finally chatted with a online rep on Wednesday and come to find out that the other rep hadn't updated my address the way she said that she would. So it was shipped the wrong address. So I might have to pay for their error. But at least I have them now and can finish the final necklace for the BSBP. 3. I can use my right arm without pain! My elbow has been killing me for almost a month but it's all gone now. This makes for a very happy Shaiha especially as I have been busy working on my jewelry and it hurt. But when the muse calls I answer. Any problems let me know and I'll edit.